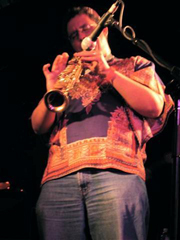 Samuel Thomas, performer and ethnomusicologist, holds two degrees from Berklee College of Music in Jazz Composition and Performance and is currently finishing a Ph.D in Ethnomusicology at the City University of New York. His work includes North African musical traditions, Arab music, Jewish music research and jazz, rock and American popular music. He is founder and executive director of JATM (Jewish Awareness Though Music) and bandleader of Asefa, an ensemble devoted to contemporary approaches to composition, improvisation, and fusion drawn from Sephardic and worldwide Jewish musics. He is co-founder of FourMinusOne, a jazz/rock power trio formed in 1997. Recordings with FourMinusOne include At Any Given Moment, Live! and Split Decision. He currently performs worldwide, teachers privately, and is adjunct faculty at CUNY.